A LITTER SURVEY has shown that while 75% of towns and cities were found to be as clean or cleaner than European counterparts, our main cities remain littered. The Irish Business Against Litter (IBAL) survey for 2013, which looked at 40 areas across the country, placed areas in Dublin, Cork and Limerick in the six lowest positions on the table – many having deteriorated in the last year. 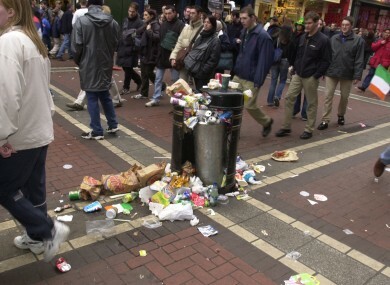 Dublin keeps its ‘Dirty Old Town’ label, remaining the city with the most litter. The survey also exposed Dublin’s North Inner City and Farranree in Cork as litter blackspots. Kilkenny and Cavan were once again the cleanest city and town, followed by Killarney, Tramore and Longford. They were among 18 towns deemed to be cleaner than the European average, so it’s not all bad news on the litter front. The survey also found a dramatic improvement in the condition of roads to and from Dublin Airport which means that, at the very least, we’re hiding it well from the tourists when they first arrive. IBAL said residents associations, tidy towns groups and other volunteers in rural areas are compensating for the scarcity if resources in local authorities and this may explain the rural-urban divide as these groups are often absent in city areas. “In cities, communities tend to be less cohesive and relying on volunteers to clean up a large urban area is not feasible,” commented Conor Horgan of IBAL. However, establishing such groups has to be part of any urban authority’s plan in the current cost environment. It’s not just the physical work these groups carry out, it’s the sense of responsibility they create, which rubs off on the whole community. If people see their neighbours picking up litter, they are less likely to litter themselves. Routes between towns were found to be typically more littered than the towns themselves. Along the Maynooth to Kilkick road, “sweet papers, plastic bottles, plastic bags, fast food wrappers and cans” led the way while the Leterkenny to Lifford road was “spoiled by a steady trickle of cans and plastic bottles in the hedges and roadsides”. Sweet papers were by far the most common form of litter, followed by cigarette butts, fast food wrappers and chewing gum. Most recycling areas were littered, with car parks and residential areas also more likely to be littered. Email “Dublin, Cork and Limerick are the dirtiest cities in Ireland”. Feedback on “Dublin, Cork and Limerick are the dirtiest cities in Ireland”.